Dawson and Brett get a call for a young girl who was hit by a car riding her bike. The driver collapses into cardiac arrest. Dawson shocks him awake. The new temporary chief takes them off of service for taking both patients in the same ambulance. 51 gets called to a man threatening to jump off a building. The man jumps, but the firefighters are prepared and they catch him and pull him back with a rope. Mouch flies Leon in to surprise Cruz for his birthday, but the surprise is nearly blown. Cruz becomes worried about him but Mouch insists they keep up the ruse. 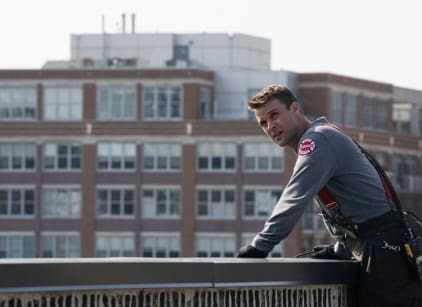 Hope gets a job at 51 working in the bullpen, much to Severide and Brett's surprise. The sister of the jumper stops by the house to thank them for saving her brother's life. Mullins recommends Casey for a promotion to captain after saving the jumper. Hope tells Severide that their night should be a one time thing now that she's working there. They manage to get Cruz to Molly's for his surprise party. Mouch announces Leon and he doesn't show up. He pops out from behind the bar as a prank on Mouch. Connie tells Brett that Hope stole ten grand from her last boss.